The plethora of ministry surrounding IronMan Lake Placid proved the value of teamwork – between racers, ministries and churches! It was truly an answer to Jesus’ prayer, “that they may become perfectly one, so that the world may know that You sent me and loved them even as You loved me.” (John 17:23). Nine churches from four states joined under the umbrella of North Country Ministries, which was one of four ministries represented. 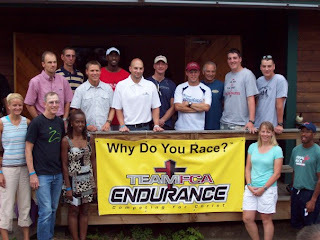 FCA, FCA Endurance and IronPrayer were the others. In their unity, Jesus Christ shown forth. At the IronPrayer Service the day before the race, three athletes shared how much of a difference Christ makes in their lives. A crowd of up to 250 people gathered to worship, pray and listen to the testimonies of Brad Seng, Carrie Chavez and Jay Fetterman. If you'd like to hear the podcast of the service, click here: http://www.lpbaptist.org/IronPrayerLakePlacid2009.mp3. Among other things, volunteers served at registration, helped with the IM banquets, served as road marshals, hosted two aid stations (one on the bike and one on the run) and fed 1300 people pancakes the day before the race. That’s a lot of pancakes! They also hosted a rather unique expo booth with snow cones, a prayer station, face painting and balloon animals. That the Spirit was working through their service became evident as they witnessed sixteen professions of faith in Jesus Christ at the IronPrayer Service and had the wonderful blessing of baptizing three additional individuals in Lake Placid before the race. Praise God! And thank you to those who made yourselves available to Him by volunteering! They closed the very long race day thanking God for the great race and for the amazing opportunity to work alongside Him. God certainly is good. All the time!